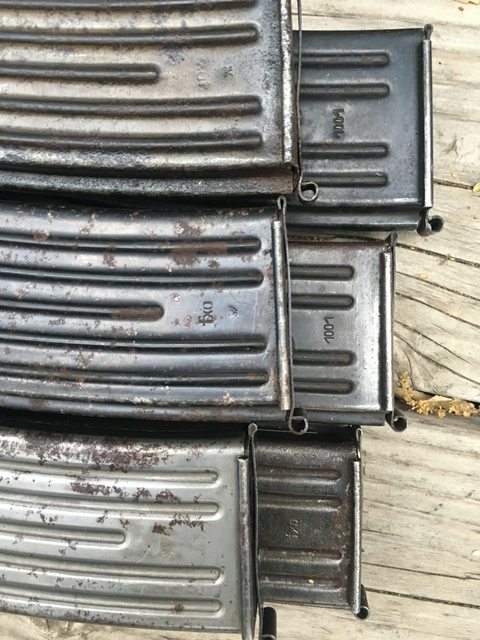 Just curious has anyone here paid over $500 for a regular WW2 MP44 magazine - ? They are not rare on auction or forum classifieds (easy to find in Europe, even England, and Germany), really only desirable if you own an MP44 (though I am sure a few collectors in non-gun countries require one or two in their collection.) and although I am not sure what the numbers are in circulation, there must be an enormous amount out there, as several manufacturers got in on the action in WW2 and just from what I have personally owned, seen and handled I would guess the surplus number of mags in the tens of thousands. The prices being asked seem to be a case of a small number of collectors "jacking" themselves - please excuse the poor use of that term, but it describes it well, IMO. Would like to hear others thoughts on this. I know the replica magazines never quite got it right, certainly the two I have had were rotten, one doesn't fit the well, the other doesn't cycle well - I know there was a big surge in the price of the MP44 parts kits, based on folks buying them for instead of a 401K type investment. I know Brad Pitt used an MP44 in Fury. I know a transferable MP44 is $15K and up, so the chaps requiring spare mags for shooting guns are universally a little wealthier than average, so fleecing them a little might seem sporting enough, though once they have enough mags the buyers are gone again. But when something is in such abundant supply, it still doesn't quite explain the price surge. I probably have enough mags for my two MP44's and don't really need more, so it's not even from a frustrated buyer angle, but, it is interesting to me how the dollar numbers in collecting shift. Anyway, thoughts and comments - thought it might be an interesting discussion really. *The curious thing to me is that my two most reliable mags, the two that just don't cause issues with my rifle are the two 1001 Post-war German mags. Some of my beat up old work-horses - these work for their living, so pristine finish isn't a deciding factor. As with anything, people will try to get as much as possible, and if other people are paying...what can you do? Even stupider in my book is G43 prices, and even more...Jap MG mag prices!!!! Its crazy! Did you get it from my buddy? I know how crazy they are cause he told me at the SOS! I know IMA sold these mp44 kits with 6 mags for 400 in '96-'98. I wish I had money back then! When I got into collecting around 2004, you could find most G/K 43 mags for a 100 a piece and the average mp44 mag was around 200-220. Now it seems you can't touch a k43 mag for less than 300, and common mp44 mags are hovering around 500-550. Most I’ve ever paid was $330 a mag for 6 mags in factory grease with the provenance to prove it. Anyways I wouldn’t pay more than that as I have over these years hit over a dozen. I also I have a good supply of mag parts ( sold at RTG) at times I am offered mags shells or mags that do not function well. I picked up 2 mag shells from Poland a few years back they fit and function fine now. Impulse buying seems to be another factor like these mags are rare, its the opposite they are plentiful. The impulse buyer only know GB or Flea bay, we have a few "neckbeards" to use a term borrowed for ar-15, selling mags here for those insane prices.